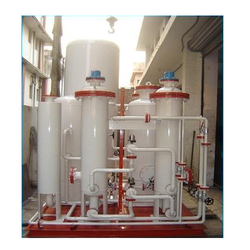 Manufacturer & Exporter of Ammonia Cracking Units. Being counted among the prominent names, we are offering Ammonia Cracking Systems to our valued customers. These units are designed by our expert professionals as per the approved industry norms leading to sophisticated operations and superior performance. Easy to maintain, these systems can be purchased at affordable prices and have gained huge appreciation among industry users. The Ammonia Cracking Units are being used as an easiest & cheapest way of producing hydrogen by cracking of ammonia into its constituents for the past many years in India for industrial use. We have also made many innovations to make it safe, user’s friendly & economically cheap. The hydrogen is produced by cracking of ammonia in the presence of Nickel based catalyst at above 850 0C temperatures. The ammonia is drawn either from cylinders or from bulk storages and the conditioned before being passed through a pressure regulating valve for desired pressure output. This ammonia is then passed through a liquid separation followed by a 2-stage De-sulphurisation unit so as to avoid any oil & sulphur effect on the catalyst and then through a heat economiser the ammonia is being pre-heated and then enter the Retort which is filled with Nickel Catalyst. Though the ammonia cracks at 850 Deg C into its constituents but Molsieve prefer to operate at 900 Deg C. temperature as residual un-cracked ammonia reduces below 50 PPM at 900 Deg C temperature. Further a heat reactivated, dual bed system is used to remove moisture & un-cracked ammonia present in cracked ammonia to produce a bone dry gas. We have further developed a system called PSA Hydrogen Enrichment Unit which is being employed after the puri-dryer and enrich the hydrogen to 95-99% as desired through an adsorption system. This is again a dual bed system filled with special grade of molecular sieve which adsorb nitrogen from cracked gas mixture. These units are very popular with Auto Parts Manufacturers, particularly for SS Brazing, SS Sintering & SS Annealing and Hydrogenation of chemicals and even in Power sector.